I recently started knitting #06 Feather and Fan Dress from Vogue Knitting, Spring/Summer 2009. In last week’s blog post, I described my struggles with the beginning of the dress. I’m happy to report that since then, the project has been moving along smoothly. As I’ve been working my way closer the to waist shaping, the skirt has been narrowing. 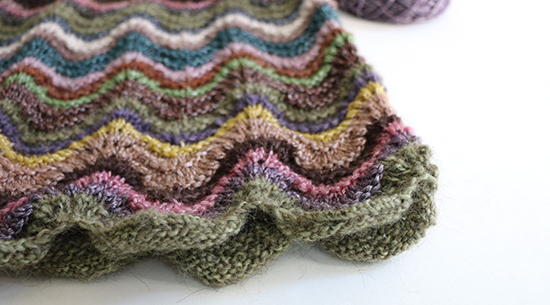 This speeds my progress with fewer stitches to knit in each round. It also eases my mind that I’ll have enough yarn to finish the dress because I’m using less yarn in each round. At the same time, the rate of the decreases is making me wonder if I should have stayed with knitting the larger size. The dress is going to get narrower before it gets wider, but I’m not turning back now. I can gift it to someone smaller than me. As I mentioned last week, I started with the green Moorland yarn at the hem of the dress because I have the most of it. I also intend to use it at the neckline to frame the dress as a whole. I’ve been trying to maintain contrast between the colors, and the fact that I have roughly twice as many colors of Lustrous as I do of Moorland has a guided my yarn selection. 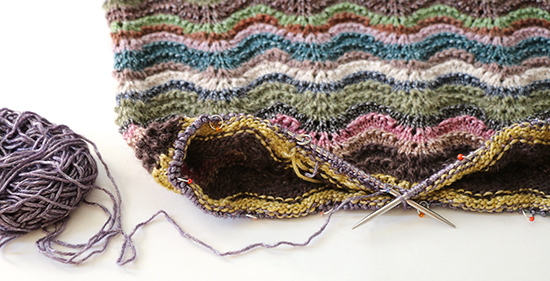 I’m following a loose pattern of one color of Moorland followed by two colors of Lustrous. 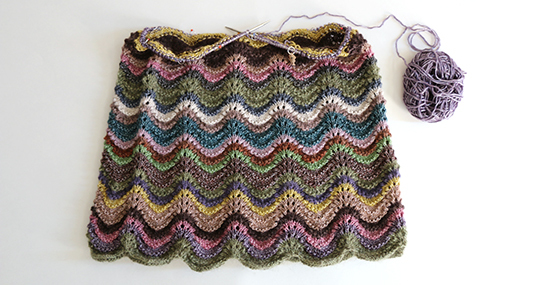 To add to the visual interest of the dress — as if undulating stripes in 16 colors weren’t enough — I am knitting a double repeat of every fourth color to create wider stripes at regular intervals. I am also making a conscious effort not to repeat the order of the colors. Doing so ensures that it won’t be easily noticed if I run out of any particular color. The dress is large enough now that I can’t easily knit it when I have a little downtime outside of the house. Instead, I’ve been taking spinning projects with me. I’ll write about them in a future post, but you can get a sneak peek by visiting my Instagram feed. I hope to see you over there!